Light-rail ridership continued to climb in October, continuing a historic year for the METRO Green and Blue lines. Nearly 1.3 million Green Line rides were recorded last month, beating the light-rail line's previous monthly high of 1.25 million set in September. More than 10.2 million rides have been taken on the Green Line through the end of October. Average weekday ridership on the Green Line has also exceeded 40,000 for the last 10 weeks. The average weekday projection for 2030 was 41,000 rides. With another 961,000 rides in October, total Blue Line ridership has reached almost 9 million and is on pace to set a new annual ridership record. The previous record of 10.5 million rides was set in 2012. > On Sept. 3, single-day ridership on the Green and Blue lines topped 100,000 for the first time ever. > More than 1 million rides were taken on both the Blue and Green lines in July. > In April, East Bank Station became the first Green Line stop to reach 1 million boardings. > A decade after opening, the Blue Line surpassed 100 million total rides in January. Combined, more than 7.75 million total rides, including 5.5 million bus rides, were taken last month. Nearly 72.3 million rides have been taken through the end up October, up about 2 percent compared to last year. ​ Digital displays that provide NexTrip information have been installed at several busy boarding areas around the region, nearly doubling the number of signs up systemwide. NexTrip signs are now located at transit centers in Minneapolis, St. Paul, Brooklyn Center, Columbia Heights, Maplewood, Robbinsdale and Roseville. Signs have also been added to bus stops near several METRO Blue Line stations, including Franklin, Lake Street/Midtown, 38th Street and 46th Street. The signs provide real-time predicted departure information for all routes departing within 15 minutes at the stops where they are located. The sign posts also have buttons that can be pushed for audio announcements of upcoming departure times. NexTrip signs have been in use since 2009 along the Marq2 corridor in downtown Minneapolis and at the I-35W and 46th Street Station, South Bloomington Transit Center and the Mall of America Transit Center. Digital displays with NexTrip information were activated at all light-rail stations earlier this year. New downtown St. Paul bus shelters that opened at busy boarding locations this year also include NexTrip signs. Metro Transit is focusing on improving bus boarding areas through its Better Bus Stops program. In addition to NexTrip displays, enhanced signage and shelters are being installed at sites across the region. Mukhtar Abdi spent ten years interacting with the public as a Metro Transit bus operator. He’ll continue to do so, but in a much different way. This week, Abdi was among 13 men and women who were sworn in as the newest members of the Metro Transit Police Department in front of friends, family and fellow officers. “I really just wanted to serve the community in a new way, to have more interactions and more engagement,” said Abdi, the latest officer of Somali descent to join the department. With the latest hires, the department now has 108 full-time officers. With another 100 part-time officers, the department is among the largest in the state. Transit Police patrol busy transit areas and regularly ride on buses and trains. They can respond to any call for service in Metro Transit’s seven-county service area. In addition to growing the force, the new class builds on the department’s continuing efforts to diversify and reflect the community it serves. 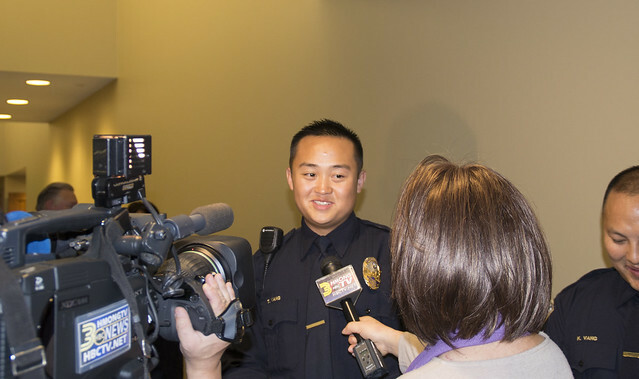 Around half of the new hires speak a second language; there are also three officers of Hmong descent. Six of the new officers are female. The group also highlights the department’s efforts to build from within, with five officers previously serving as Community Service Officers. CSOs assist officers and police staff while pursuing law enforcement degrees. “We’re creating a pathway for people right here at Metro Transit to pursue their dreams without having to go anywhere,” Police Chief John Harrington said. To learn more about job opportunities with the Metro Transit Police Department visit metrotransit.org/police. For nearly 20 years, Leslie Ross has taken the bus to and from his job in downtown Minneapolis. Since moving to Maple Grove in 2007, that’s meant riding Maple Grove Transit Route 781, an express service that gets him from to and from work in a little over a half-hour. The opportunity to trade a stressful and time-consuming commute for a faster and more enjoyable ride has led many others in the north metro community to the same conclusion. In 2014, more than 788,000 rides were provided on Maple Grove Transit’s six express routes with service to downtown Minneapolis and the University of Minnesota. Though buses and Park & Rides are owned by and carry the name of Maple Grove Transit, the service itself is operated under contract by Metro Transit. Metro Transit’s operators drive the buses, mechanics at Metro Transit’s Martin J. Ruter Garage maintain the 39-bus fleet and fare payments are made using the same system used on Metro Transit vehicles. Metro Transit’s Customer Relations department also assists with feedback from Maple Grove Transit customers. The City of Maple Grove manages Maple Grove Transit through its Transit Administrator, who conducts transit planning, administration, customer service and marketing. The city also has a Transit Commission of eight customers who provide input. Metro Transit has provided Maple Grove Transit services since 1990 and will continue to do so through at least 2018 after the recent approval of a three-year contract extension. Maple Grove Transit Administrator Mike Opatz said Metro Transit has consistently provided great service and that he looks forward to building on the successes of the last 25 years. Among the improvements made this year was the addition of free WiFi to some Maple Grove Transit buses. For customers, the fact that the buses say Maple Grove Transit while the operators wear a Metro Transit uniform isn’t all that significant. Instead, they’re just happy to have an alternative to battling congestion on Interstate 94 (Maple Grove Transit routes use bus-only shoulders to bypass traffic). On the same trip as Ross, the 20-year transit veteran, was newcomer Tara Roberts who began riding the bus just a few weeks earlier when she started training in downtown Minneapolis. Able to board just blocks from her home, Roberts uses her time commuting to text with her children instead of stressing about traffic and parking. “I get anxiety when I drive downtown so I really didn’t want to deal with it,” she said. After moving from Puerto Rico this summer, Carlos Muniz said he will be especially grateful that he can walk or take a short drive to the Maple Grove Transit Station near his home instead of having to drive as he faces his first Minnesota winter. Routes: Routes 780, 781, 782, 783, 785 and 788 provide express, weekday service to and from downtown Minneapolis during peak periods. Route 787 offers midday and evening service on weekdays. Route 789 provides weekday express service to the University of Minnesota when fall and spring classes are in session. Park & Rides: Free parking is available at five Park & Ride locations. Open since 2003, the largest Park & Ride is the Maple Grove Transit Station near the Shoppes at Arbor Lake; it features 926 parking spaces, a climate-controlled waiting area and bike storage. Open since 2010, Parkway Station has 800 parking spaces. Smaller Park & Rides are located on Zachary Lane, at Cross Winds Church and at the Shepherd of the Grove Church. Ridership: Customers took 788,000 rides on Maple Grove Transit routes in 2014; ridership has increased more than 10 percent since 2010. > Good Question: Why are some routes operated under contract? For Denny, who raised two children in a home just blocks from the site, the promise of more neighborhood vitality further affirms his decision to call Corcoran home. Getting to this point hasn’t come easily, however. For more than a decade, officials and community leaders have been talking about how to enliven the area surrounding the light-rail station. Successful negotiations allowed the county to take control of more than six acres, including land used for a Metro Transit Park & Ride and a Minneapolis Public Schools building where adult learning classes are held. The Park & Ride closed earlier this year, and MPS will remain on site while searching for a new location nearby. The Human Services Center, including retail space along Lake Street, is expected to open in late 2017. More than 100 apartments are also part of the first phase, with more housing to be phased in over time. County officials pursued the deal as part of an effort to create a decentralized network of service centers to better serve the community. More than a quarter of county residents receive county assistance and more than 16 percent of those people are expected to use the new Lake Street location. In addition to giving people better access to services, the redevelopment will bring housing and job opportunities that benefit existing residents and draw more people to the city. “What we have now is a chance to re-create urban America as a place of opportunity,” Hennepin County Commissioner Peter McLaughlin said. Opportunity is also on the minds of more than 50 vendors at the Midtown Farmer’s Market, which wrapped up its 13th season in October. Though plans remain in the works, organizers look forward to having more conveniences for sellers and a better environment for all who attend. “This will establish a real sense of permanency and create something that really feels like a home for the market,” Market Manager Miguel Goebel said. Transit-Oriented Development isn’t isolated to the Lake Street/Midtown Station area either. Be the Match’s 900 employees will soon move into new offices next to Target Field Station, one of several developments in the rapidly-changing North Loop neighborhood. In St. Paul, a portion of a $28 million project that will bring more than 100 affordable apartments to what was a vacant used car dealership north of the Green Line’s Hamline Avenue Station will open in December. Metro Transit General Manager Brian Lamb said these and other projects that bring jobs, housing and services to areas that are well-served by transit make the Twin Cities more accessible and equitable. “Transit-oriented development is about letting people choose where to live, work and recreate — and giving them the freedom to make those choices without worrying about the financial burdens they’ll face when it comes to transportation,” he said. > Opening in 2017: Hennepin County Human Services Center, 114 workforce housing units, 8,000 square feet of retail space fronting Lake Street, a transit plaza and parking. > Later phases will include the public gathering space, more than 400 residences and additional parking. > The project is being developed by L&H Station development, LLC, a joint venture between BKV Group and Launch Properties. > Star Tribune: Officials break ground on development at Lake St. and Hiawatha Av.